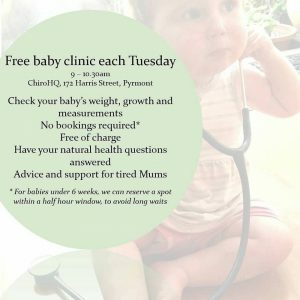 Every Tuesday, from 9-10.30am, MamaCare runs a free drop-in baby clinic in Pyrmont. So if you’re in the inner city or inner west, please feel welcome to drop in! There are very few in this part of Sydney, so we wanted to make this service available for our local mums, dads and bubs. This complimentary drop-in clinic runs from 9am – 10.30am each Tuesday morning. Location: ChiroHQ, 172 Harris Street, Pyrmont. This is free service for local families. No booking required: we run on a first come, first served basis. Depending on how busy it is, we’ll have 10-15 mins to measure your baby and check in with how you’re going. As well as weighing / measuring / checking temperature, our naturopath Kathleen Murphy can also answer questions on natural health and remedies. And there’s almost always a pot of herbal tea on offer in the waiting room! If you have any questions, feel free to call the clinic on 9660 7222, or just drop in.